Native to Australia and South Pacific, there are over 40 species of Cockatoos. They love attention and want to be with their owners as much as possible. Although they do have some talking ability they’re entertaining birds that are best with experience and committed caretakers. Cockatoo’s are highly intelligent birds, known for their affectionate and cuddly behaviors. They love to be handled and bond very strongly with their care takers. They are also very entertaining birds being energetic, playful, and silly parrots. If you ever get the chance to watch a Cockatoo ‘war dance’ or play ‘psycho bird’ it makes for great entertainment. Some species of Cockatoo can learn to talk, but they are not particularly accomplished talkers. However they are not afraid to be heard. Cockatoos are loud birds and prone to unexpected outbursts. Probably not the best choice for an apartment of close living quarters. Like most parrots, Cockatoo parrots benefits from plenty of time to exercise. Three to four hours a day outside of the cage is ideal. Toys, toys, toys. These birds benefit from a wide variety of toys to keep them entertained and socially alert. If you are not able to get them outside of the cage for an extend time each day, consider investing in a Play stand or play top cage to help them stay entertained. 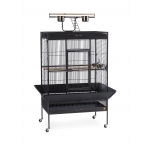 Being one of the larger pet parrots, probably the most important factors to consider is when selecting a Cockatoo bird cage is the interior space. Another consideration is placement of the bird cage. Cockatoos like lots of interactions with their owners so choosing a bird cage which can be located in a high visibility area of your home that promotes lots of interactions. Most experts recommend getting as large a bird cage as you can afford. As a rule of thumb, the cockatoo should have room to flap their wings freely. A good cage choices is 36” wide, 24” deep, and 40” high (or larger). If space is a concern, a minimum cage size is 34” wide, 24” deep and 36” tall. Toys, toy, toys. All parrots like things to keep them entertained and alert. Cockatoo parrots are not exceptions and will benefit from have a wide variety of toys and activities in their bird cage. Rotate the toys and activities periodically to keep things fresh and changing, like the wild. 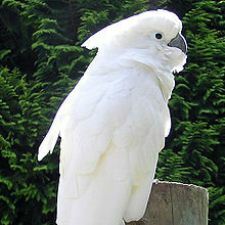 - Cockatoos are active and benefit from a larger cage, consider a minimum of 34" wide, 24" deep, and 36" tall.